I hope you didn't take offense, as none was intended. YES! and Yes again! WC in BW are a very common work, maybe twice or tree timer per week.. ¿how to reduce this job? : With a SW equipment, i still remember PP recommend me to use a Skimer to help the Canister, when i did that, the aquarium looks like brand new, it´s the best step for a BW and should be done from the beginning. Skimmers barely works at all in BW. BW fish in general are an issue because nobody can match their environment in semi-closed systems. So we opt for stability at an arbitrary specific gravity. FYI, 1.022 can be considered or defined as SW or marine. The density of the Red Sea is not required for marine conditions, and most SW do live longer and healthier in rather light SW, so 1.021/1.022 are generally accepted and do allow LR critters to function. good to know a full salt setup will save you money. that is definitely not the immediate assumption as all the initial costs of the SW are so great. but i can see how in the long run it saves you money. when you have fish like GSP's that live for so long it is very important to consider the long run. They say you can house a Ceylon with Mollies or Bumble Bee Gobbies... Good luck. My Ceylon will NOT LIVE with anything. When you click on the link "Ceylon Puffer"... It brings you to a page that calls a Ceylon a "green spotted puffer". This is wrong. A Ceylon is Tetraodon Fluviatilis, not Tetraodon Nigrivitis (or whatever). Perhaps a GSP can live with others, but a Ceylon will not. Not in the 5 years I've had mine anyways. These are only suggestions--it all depends on the aggression of the individual puffer. My fahaka lives with a tank full of different fish. Balki would be lost without his silly little molly friend. Yes! Mollys are nice friends! my GSP has lived their entire life until now with P. sphenops. 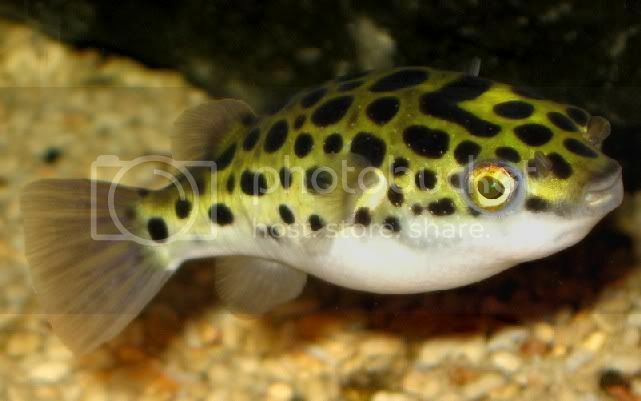 But this depends on the puffer´s personality, just like PP said. My GSP Izabella has now lived in BW around 1.012 for 8+ years. Woland wrote: My GSP Izabella has now lived in BW around 1.012 for 8+ years. Thanks for posting Woland, opinions on this forum have become very one-sided when it comes to GSP's and salinity. It's nice to see that your GSP is looking so healthy at SG1.012. Have not measured her for years. In full marine it may have hit it's full size? Hmm I guess this one is still open for debate?